If you work with wood at any level, you know and appreciate the versatility of the hand-held router. The photo is another hand-held router and you’ll note there is no power cord – it’s from the era when hand made really meant hand made. 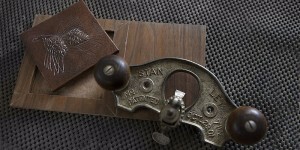 This a Stanley 71-1/2, Type 3, Router Plane manufactured between 1906 and 1910. This vintage router plane gets a lot of use in our shop. 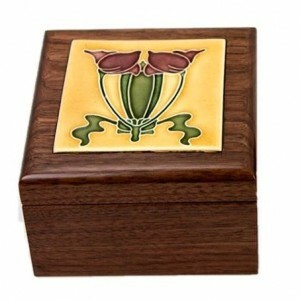 We construct many boxes that have tiles inlaid into the lids like the following photo. The router plane makes simple work of fine tuning the recesses for the inlaid tile by cutting very thin shavings, almost translucent, from the bottom of the recess to obtain the perfect fit. It is also used a lot for creating perfectly flat bottom dados and rabbets. Can you do that with a new powered router? Sure can. But why would you when you can pick up a 109 year old, super sharp, Stanley router plane and admire the translucent shavings peeling off the knife?